As we speak, meteorologists are hard at work describing what the wind conditions could be like at Wrigley Field on Friday night, as that ballpark plays host to its first World Series game in 71 years. And obviously handicappers are paying some attention to it as well, because there could be some very real impact on the way the game is played. The weather projects to be relatively warm, as temperatures may be in the 60s. But that isn’t the full story. Wind is the bigger part of it, as it often is in this lakefront metropolis. And that wind will be blowing southwest, which means that it is heading toward the outfield. The only question is how high the gusts are. The initial forecast was said to be 15-25 miles per hour, although some sources have reported that it could go as high as 40, although those estimates have been lowered somewhat throughout the day. The wind is expected to be blowing out to center and left-center, which means a little boost to those with rigfht-handed power. 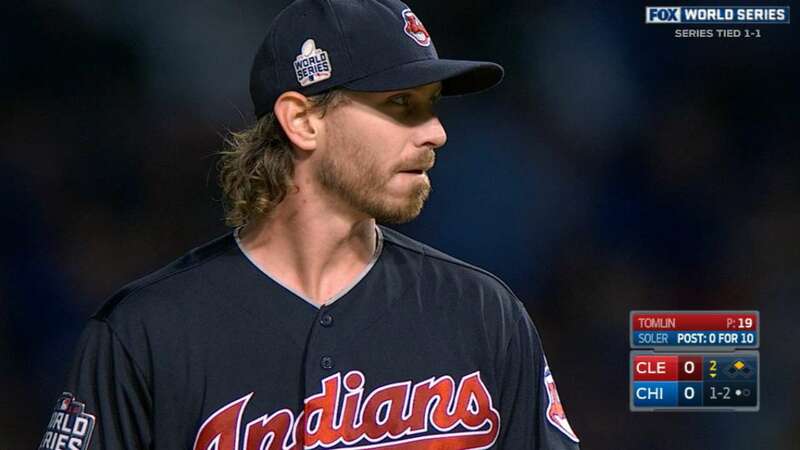 The terms “Josh Tomlin” and “home run” have been heard in the same sentence far too often for this not to be of some concern to the Indians. Tomlin gave up 36 home runs during the regular season – the third-highest figure in all of Major League Baseball – and that translates to roughly 1.87 per nine innings. His control has been so good, however, that he gave up sixteen more homers than he did bases on balls, and that is so incredible that no pitcher since World War II has exhibited that kind of difference. Tomlin throws an 88 mph fastball, which might be a reason for it. Some hitters have enough bat speed that if a guy like Tomlin is around the strike zone – which he obviously is often enough – it may seem like batting practice. Don’t forget that is throwing against a wind as well, so that might cut into his velocity a bit. So adjustments had to be in order. What Tomlin did in the latter part of the season, after getting beat up pretty good in August, was go to his curveball and sinker a lot more probably under the theory that if you are going to be slow, it might as well be moving and down in the zone. And the results have been impressive, to say the least. In his last 37-1/3 innings on the mound, he has surrendered just ONE home run, and he has become essential during this post-season push, and not just because anyone who is a healthy starter could be essential to them. If he can control those pitches, he is dangerous to the Cubs, who had the lowest contact rate against curveballs in the major leagues. And Tomlin will be very excited that his dad, paralyzed from the chest down, will be in the stands to watch him pitch. But then, you’ve no doubt read that story everywhere already. Interestingly enough, the temperatures are expected to get a lot more chilly for Game 4 on Saturday, and the wind is supposed to be blowing in, which makes it even less problematic for Cleveland ace Corey Kluber as he goes up against John Lackey in the anticipated pitching matchup.